Uffizi Gallery is well known for its impressive collection of Renaissance artwork including the Birth of Venus. If you need something different to look at amongst the art the gallery also has one of the best views of the Arno river and Ponte Vecchio. If you look closely enough you can even see the hidden passages the Medeci’s used to access Ponte Vecchio to cross the river without being seen. Book your tickets here. If you pre purchase your tickets you can skip the lines. The beautiful manicured gardens that are Baboli are worth a wander. They are slightly different to what I expected it is not about individual gardens like Regents Park but about the park as a whole. Make sure you walk to the top of the gardens and then just sit and enjoy one of the best views over Florence. Book your tickets here. The Forte is a museum during the day but it is also a great place to watch the sunset from in the evening. There is even a little cafe/bar so make sure to grab a glass of pressecco and watch the sun go down. Whether that is some gelato an Italian picnic in the garden of your hotel like I did at Palazzo San Niccolo or out at a restaurant. My sources tell me that the best pizza in Florence is from Gusta. The segmented bridge is always bustling with people when the stores are open. It is worth strolling across and checking out the stores. Although it can look even better from afar so make sure to walk across the bridges on either side to get the best view of the bridge. I stayed at Palazzo Belfiore and Palazzo San Niccolo during my time in Florence. They are perfectly located within a few minutes of Ponte Vecchio. The rooms at Residence Palazzo Belfiore are incredible. I had my own little studio apartment which was welcoming, cozy and the perfect place to come home to. The ceiling was still the original from 14th Century and the furniture was the perfect mix of modern and antique. Palazzo San Niccolo is the sister residence to Palazzo Belfiore and after such a good experience at the first I couldn’t not try out the second. It is a more modern residence and is relatively new. My room was beautiful but what I really loved was the garden it is such a lovely area that the entire residence has been booked out a few times so people could be married in it. Green space is a premium in Florence so to be able to relax in the garden was something I really loved. There is even a little terrace over looking the garden if you are wanting a little bit more privacy. Florence is filled with beautiful old churches that are colourful and wonderful to explore. My favourite was the Church of Santa Maria Novella, if you see it from the back it does not look as though it is anything special however the facade at the front is breathtakingly beautiful and intricate. I sat in the square and had breakfast one morning admiring the architecture. We left it to late to get tickets to go up the Duomo so we had to settle for finding somewhere with a good view to see Florence close up and from above. There are a few spots that have excellent views however my favourite is the rooftop bar at Grand Hotel Carvour it was quiet and has a perfect view of the Duomo just behind the bar. I got up early one morning just so I could basque in the glow of the Duomo almost by myself. It is an incredible building and worth exploring every crevice which is why hoardes of tourists can be found at its base st any one time, if you can wake up I recommend going early I was there with only a handful of people at around 7AM and it was such a different experience then visiting it during the day. If you are organised book your tickets to go up the towers of the Duomo in advance to ensure you don’t miss out. You can book them here. For stunning sunset views head up to Piazzale Michaelangelo and watch the sun go down. This is the best view point of Florence and is worth walking up the stairs to get to. If you find it to be a little crowded you can continue to head up the hill to the Basilica San Miniato Al Monte for the same view only a little more quiet. Thank you! Definitely on my bucket list. Looking at your photos reminded me the days I spent in this beautiful city. Great photos! Beautiful city! The Duomo especially is stunning. Now on my bucket list 😍 Thanks for sharing! Beautiful photos💖 Reminded me of my trip there a few years ago. I need to go back now! I don’t know if it was intentional, but the colors in the first five photos are great! I like the red, blue, green, and white that just add a lot of movement to the story. Looks like a cool place! 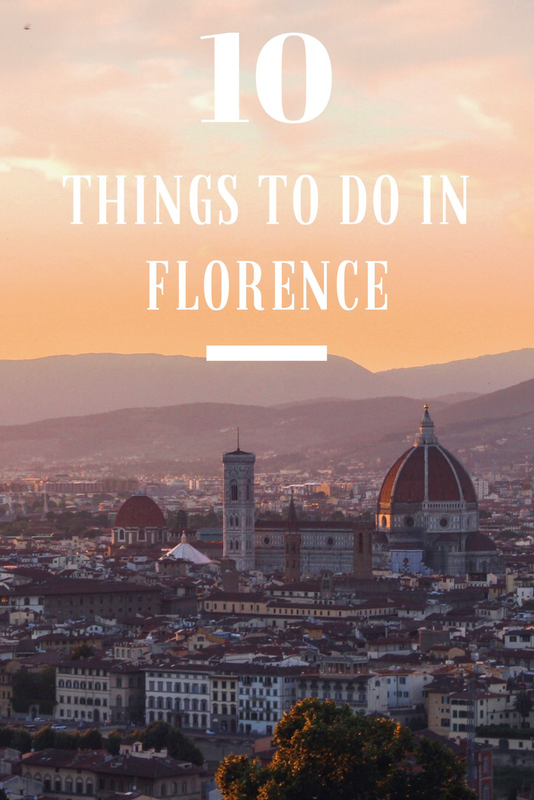 great list, thanks, will use this for visiting Florence. I will be going to Florence soon, and am so excited! Your pictures are beautiful and amazing, and thank you for the tips on what to do!